Did you ever see a Hippo on stage? Incredible as it may sound, you can currently see a hippo “on stage” nightly in London’s theatre land. We should explain that this is not the jolly and rather rotund animal usually found wallowing in mud on the banks of the Limpopo River. It is, in fact, the much celebrated Handicare Hippo power wheelchair. It is used by Australian actress Kiruna Stamell (of Moulin Rouge fame) as part of the plot in a highly amusing satirical success called “Great Britain”. The play has been running at the National Theatre on London`s South Bank and it will transfer to The Theatre Royal in Haymarket on September 3rd. Starring Billy Piper, the production is highly topical and has received many plaudits in the national media. 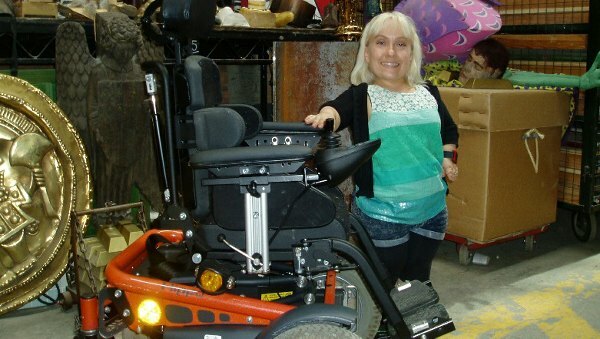 Handicare distributes its products through a national network of Mobility retailers and it was one of these, Midshires Powerchairs, who have loaned the Hippo to the production company for the period of the play`s run. We would like to thank Paul Cushen and all of his team for their help with this interesting project. The Hippo was delivered to the National Theatre by Adrian Widger who adjusted the chair to fit Kiruna in minutes and then gave her a short but comprehensive demonstration of how to drive it. As a result of this, Adrian now claims that he supplies “Wheelchairs to the Stars” so if you would like to see him in action call our hotline below, immediately.